Today on the blog I’m sharing some things that I wish I had known going into my first yoga class. First, I thought I’d share some etiquette tips. I had no idea about most of these before my first yoga class. Take off your shoes. Typically this should happen shortly after entering the studio. There will be cubbies or a specified place to leave your shoes. Leave your phone at home, in your car, or in the change room. You can go without it for the length of the class. You’ll also be able to focus better on your practice without it at the end of your mat. Once you get into the room where you’ll be for your class, keep talking to a minimum, and even then, whisper. If you want to catch up with your friend, do so in the lobby. While this might seem like common sense, wear clean clothes. No one wants to practice next to someone who hasn’t washed their top for 3 workouts. Call or email the studio to see what classes they recommend for beginners. If you’re new to yoga it may be tough to figure out the class schedule. Vinyasa flow? Power? Restorative? Yin? Before I started going to yoga classes regularly none of those would have made sense to me either. The person who answers the phone or your email should be able to point you in the direction of a few classes that are appropriate for beginners. Don’t eat right before class. Eat no sooner than 2 hours before a more intense class like ashtanga or vinyasa, but I’m usually okay if I have a snack an hour before a restorative class. This will vary depending on the person, but just be aware of how you’ll feel if you have food in your stomach while doing downward dog. Arrive 15 or 20 minutes before class. You’ll want some time to get the lay of the land and get settled. If it’s your first time, they’ll probably want you to sign a waiver when you check in and pay. You don’t want to feel rushed – that’s not a good way to start off yoga! The person at the front desk may even give you a quick tour of the space including the yoga room, change rooms, bathrooms, etc. Talk to the teacher before class. Tell them that it’s your first class. They’ll be able to orient you to the room (where the front is that they’ll be teaching from, where to find the props, etc.). Tell them about any injuries so that they can provide modifications, Ask them what, if any props you’ll need for the class. Not sure who the teacher is? Ask the person at the front desk to point them out to you. Everything from how flexible you think you have to be to the kinds of people to will be in class with you. You might hate it or love it, bit if you go into it thinking that it’ll be awful, it probably will be. I can guarantee that you don’t have to be flexible to do yoga. Get a spot in the middle of the room. I know that it’s tempting to want to go straight to the back of the room, but that’s not the best spot for a beginner. There are some poses that you may do that require facing the back of the room – and if you’re at the back of the room you’ll be facing the wall – which isn’t all that useful when you’re not sure what you’re doing. If you’re facing the back wall you won’t be able to see what anyone else is doing. The middle of the room gives you the best vantage point, plus you’ll also have a good view of the teacher. In terms of how the class will be structured, the teacher may begin class sharing a few words or asking you to think about an intention. Next there’s usually a warm up, then you’ll move into the main part of the class. There may be a pose that the teacher will have you work towards if the teacher decides the poses that will be done. If it’s something like an ashtanga class, there are a set order of poses. There will then be a cool down, and the final pose will be savasana. The teacher will bring you out of savasana, he or she will once again share a few words, and then you’ll end class with namastay. At this point you’ll put away any props that you used and roll up your mat. It can be tough trying to hold a pose when you have a million things going through your head, but not breathing will make it harder. Your teacher may count breathes while you’re in certain poses, so try to follow their lead. Don’t be afraid to take child’s pose. Need a break in the middle of class? Child’s pose is always an option. There’s absolutely no shame in taking it when you need it. This is your practice, not anyone else’s, so try not to worry about what anyone else is thinking (I know that’s tough to do though). If your teacher offers the class modifications, don’t be afraid to take them. They’re there if you have an injury, can’t get into the full expression of the poses, or are simply tight. Have I convinced you to try a yoga class? 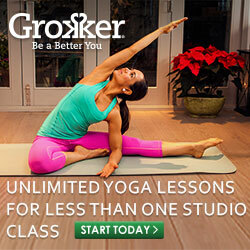 If you do yoga, what did you expect before your first class?